LNMU Admit Card 2019 has been released. Students can download LNMU Part 2 Admit Card through the link provided on this page. LNMU is conducting B.A., B.Sc, and B.Com Part 2 Exam 2019 from May 08, 2019. The exam will be conducted in two sittings (1st and 2nd Sitting). The sitting exam starts from 10 AM and the 2nd setting starts at 02 PM. The Examination will end on June 07, 2019. Students can download LNMU Admit Card through the “Roll No”. If a student is unable to download the admit card online then he/she must inform the university immediately. Check the page for detailed information on LNMU Admit Card 2019. 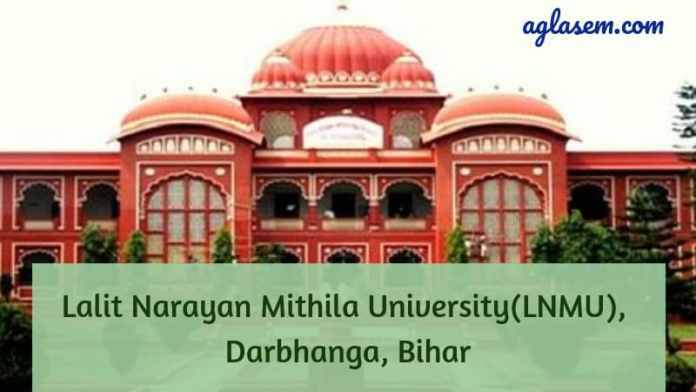 Latest: Lalit Narayan Mithila University has released the admit card for UG Part 2 exam May 2019. The exam will start from May 08, 2019. Students are informed that the admit card is available for the eligible students only. It is important to carry LNMU Admit Card along with the college id card on the day of the exam. No student will be entertained without the admit card. To know the exam centre address and subject details check LNMU Part 2 Admit Card. The University has already released the date sheet for UG Part 2 Exam. Check LNMU Exam Time Table for the exam date and centre list for conducting the exam. 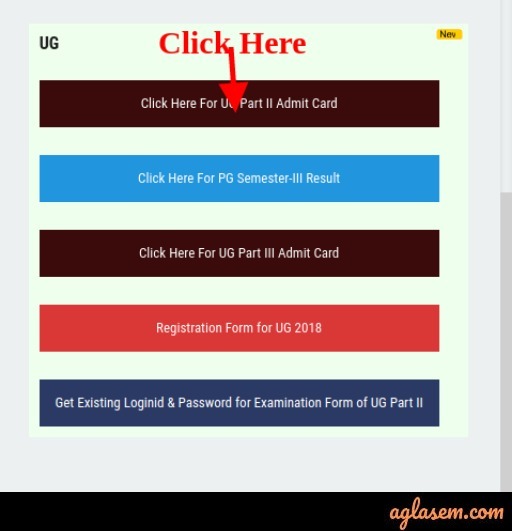 Admit Card: Click Here to download LNMU UG Part 2 Admit Card 2019. How to download LNMU Admit Card 2019? Students can download LNMU प्रवेश पत्र – (Admit Card) through the link provided above. Click the link and follow the steps mentioned below. Click the “Click Here For UG Part 3 Admit Card” link. Note: After downloading the Admit Card get the signature and seal of the college principal on it. Check the printed details available on LNMU Darbhanga प्रवेश पत्र (Admit Card) 2019. Lalit Narayan Mithila University Admit Card is the most important document to carry on the day of the exam. No students will be allowed to write the exam without the admit card. 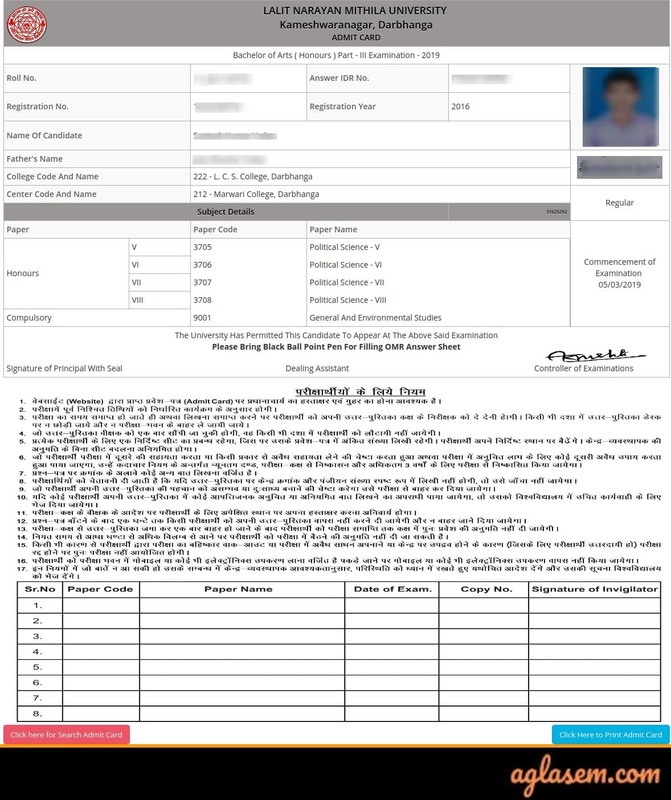 LNMU Admit Card (प्रवेश पत्र) holds the information of students, subject, and exam centre, and important instructions. Each student admit card will be verified by the examiner in the exam and after the verification, he/she will be allowed to write the exam. Keep the admit card safe and do not write anything on the admit card. Check the important instructions mentioned for the students. Carry the Admit Card on the day of the exam. Do not write anything on Admit Card. Mobile phone or any kind of electronic gadget is not allowed in the exam. Do not involve in any kind of malpractice during the exam.